Well, I told you I sent some queries out to the agents I met at the writer's conference in Austin. I sent four queries out then and have heard two no's. The other two have not responded as of yet. About a week later, I sent out four more queries to agents I have not met. But I have gotten two no's from them, too. So, I'm still waiting to hear from four agents - or to hear the "no response" response. One of our days in Quebec City we drove around the surrounding countryside. 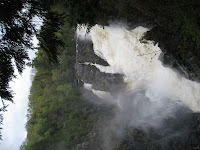 We went to Canyon Sainte-Anne and hiked around the waterfall and canyon there. The canyon has three bridges over it. Mom only went over two of those bridges, because the third one was down A LOT of steps. She never would have made it! 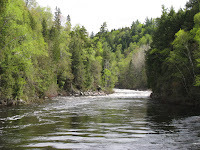 The Sainte-Anne-du-Nord River carved the canyon. From the first bridge, you get to see the top of the falls. The waterfalls from one of the viewing points on the trail. The melting snow made them tremendously powerful during May. 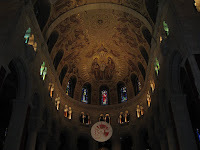 In the town of Sainte Anne de Beaupre, we went to the Basilica of Sainte-Anne-de-Beaupre. This church was absolutely breathtaking - outside and in. Pictures could never do it justice. The church rises above the surrounding buildings and the twin spires can be seen for miles around. The basilica had a very Orthodox feel to it inside. 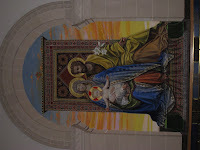 The mosaics and tile work looked like pictures I've seen of Eastern Orthodox churches. 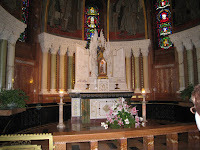 This included a relic from St. Anne herself - bone from her arm, I think. Underneath the main sanctuary, there is another smaller chapel with more paintings on the walls and decor in a gorgeous shade of blue. 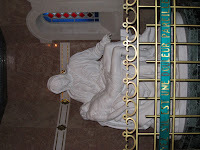 This is where the replica of the Pieta is. You can see it up close. Having never seen the original, I can only say that the replica is stunning. I could have stood there looking at that for quite some time. 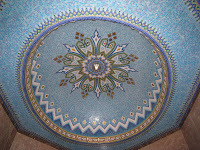 Even the ceiling above the replica was gorgeous. Look at the tile work! 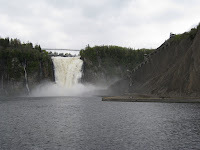 We also stopped briefly by Montmorency Falls, right outside Quebec City. This waterfall is right on the side of the highway. 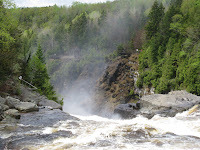 These falls are actually higher than Niagara Falls on the U.S.-Canada border. 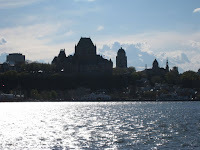 The next part of our trip was to Quebec City. Although we did not know it when we initially planned our trip, Quebec City celebrates its 400th anniversary in 2008. So, there were lots of festive decorations throughout the old city. 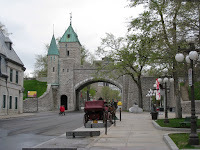 Quebec City is the only city in North America that still has its original city walls intact. We saw a walled city for the first time last year in Derry, Northern Ireland. 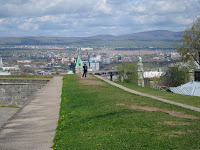 The walls in Quebec City were different - no IRA slogans and no razor wire! Our bed & breakfast was inside the city walls, so we had to drive through this gate to get to our room. And here was our B&B, Chez Marie Claire. Mom was very happy that our room was on the first floor! 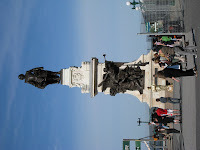 Samuel de Champlain, the founder of Quebec City, is memorialized with a statue near the Place d'Armes. The Chateau Frontenac dominates the skyline of Quebec City. We couldn't afford to stay here, but we did eat brunch here Sunday afternoon. They had a buffet set up in a huge room with various tables with different foods. I got to try some Beef Wellington, which wasn't bad. One table had nothing but chocolate on it. Needless to say, Mom and I both indulged quite a bit. Lower Town, the original settlement, had lots of shops. 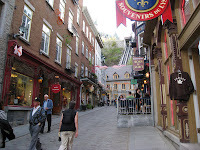 You could get down to Lower Quebec by walking down (and back up) some stairs or taking the Funicular. We opted for the Funicular. 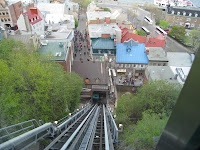 Here's the view of Lower Quebec City from the Funicular's windows. 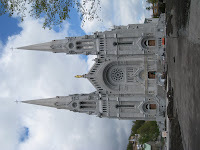 Quebec City had its own Notre Dame church - Notre Dame de Quebec Cathedral. 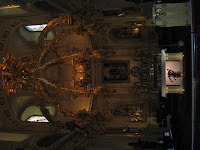 Lots of Notre Dame churches can be found throughout the province. While we were wandering around the Place d'Armes, we heard the sirens of some motorcycle police. 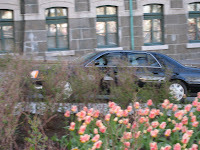 They were escorting a black car to the front entrance of the Chateau Frontenac. My celebrity radar started pinging. I told Mom to follow me and walked in the direction the car had taken. Sure enough, the current Prime Minister of Canada, Stephen Harper, climbed out and walked inside the hotel. No security around him at all. About two hours later, he left the hotel through a shop entrance. We managed to catch that, too. And got a picture of his car as he was leaving. I have no idea why he was in Quebec City. No mention of his visit was made on the English-language news. 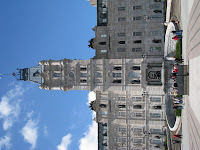 The National Assembly for the Province of Quebec sits right outside the city walls. 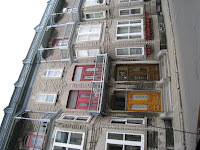 The building features nooks that hold bronze statues of people important in Quebec's history - all men, of course. In front of the Assembly is the de Tourny Fountain. 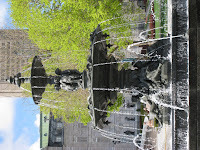 The fountain was a gift to Quebec City in honor of its 400th anniversary. It was gorgeous. We stayed there for a while watching the water fall. We took an English-language tour of the Assembly. It was interesting because the building featured decorative elements to remind the people of Quebec's European heritage - oak leaves for England, the fleur de lis for France, the thistle for Scotland and the shamrock for Ireland. The provincial motto - Je me souviens - means "I remember." 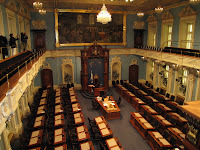 The provincial parliament meets in the Blue Room - known in French as le salon bleu - where a minority government currently rules. The room was originally painted green. The current color came about because of the advent of televised sessions, and blue looks better on television. 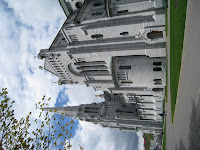 One day of our time in Quebec City was spent in Sainte-Anne-de-Beaupre and at the Canyon Sainte Anne. Those pictures are coming soon!